Yoshitsugu Matsuoka is a Japanese voice actor originally from Hokkaido prefecture. He is best known for his role as Kirito in the smash-hit anime series Sword Art Online. Since his debut in 2009, Matsuoka's voice has been featured in numerous anime titles including Soma Yukihira in Food Wars: Shokugeki no Soma, Yu Mononobe in Unlimited Fafnir and Toru Kokonoe in Absolute Duo for some of his recent roles. 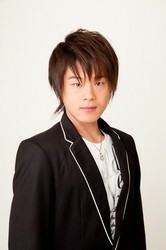 He was named the Best New Male Voice Actor at the 6th Voice Actor Awards in Japan. He returns as Kirito in the new Sword Art Online II series and as Tomoya Aki in the new anime series SAEKANO: How to Raise a Boring Girlfriend which just began streaming recently.